The Klammath trip almost collapsed due to late cancellations etc., but Mike Pinelli and I managed to get it together to get at least ourselves up there. Got up there Thursday afternoon and fished Ice Cream Riffle until dark, but got nothing. 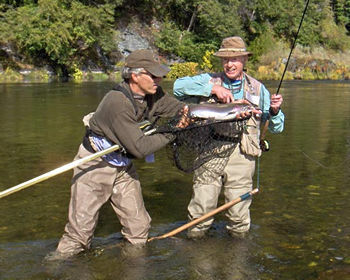 Next day we floated with Doug Cole from Marble Mountain Ranch guiding. Doug suggested a sink tip line. I had a Teeny T130 for my 6 weight, and it was just about perfect for the job. I landed two adults, and almost landed a third, plus several half pounders. I got two of my big ones on conehead muddlers and the other on a black crystal flash hackle fly of my own invention. Mike Pinelli was the half-pounder champ that day with as many as ten. It might have been just luck or it might have been that the Teeny line was getting deeper a little faster that got me into the big fish. 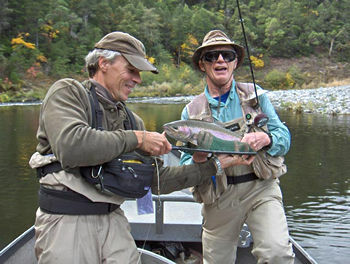 Next day we waded the Klammath, mostly upstream from the ranch and did okay on half pounders, but no big fish. I fished my spey rod with a sink tip, but I don't think it got down as well as I was with the Teeny line. I am thinking about setting up a lead core tip for it. Last day we fished the Trinity at quite a few locations but didn't get a bump anywhere. It was a very bright sunny day, and I think the fish were lying low. Hospitality at Marble Mountain Ranch was as warm as ever. Hope we can pull together a better showing next year.